The 1951 NCAA Men's Division I Basketball Tournament involved 16 schools playing in single-elimination play to determine the national champion of men's NCAA Division I college basketball. It began on March 20, 1951, and ended with the championship game on March 27 at Williams Arena in Minneapolis, Minnesota. A total of 18 games were played, including a third place game in each region and a national third place game. 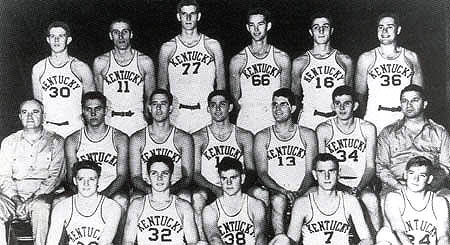 Kentucky, coached by Adolph Rupp, won the national title with a 68-58 victory in the final game over Kansas State, coached by Jack Gardner. The tournament was the first to introduce a 16-team field. Only the championship and third place games were held in Minneapolis, while the semifinals were held in the respective regional sites. In this sense, the 1951 tournament did not feature a true "Final Four." This would have to wait until the 1952 tournament. Kentucky's involvement in the point-shaving mess was still to be uncovered when No.1–ranked Wildcats arrived in Minneapolis in search of their third NCAA championship in four years. There they met No.4 Kansas State, the champion of the Big Seven. Led by 7–foot junior All-America Bil Spivey and sophomore Cliff Hagan, the Cats won, 68–58, and coach Rupp had his third title.